illustrated and with music arranged by Dany Rosevear. A Springtime finger play while learning about metamorphosis and change. 1. Creep fingers up one arm. 2. Place one hand over opposite fist. 3. Twirl finger round. 4. Put hands to cheek. 5. Put hand to mouth. 5. Open hands near eyes, draw sun in a circle. 6. . Spread fingers, hook thumbs then flap hands to fly away . “I think I’ll take a nap,” says he. To spin his cocoon, then he fell asleep. Wow! He was a butterfly, and flew away! Finger play for a snowy day! 4. Turn palms upward and shrug in disbelief 5. Rub tummy 6. Hand to eyes and look around 7. Make the bunny hand hop towards the snowman hand 8. Bunny eats the carrot with two small bites and then one big bite. A chubby little snowman, had a carrot nose. Be patient and there may well be an answer to your problems! 1. Make swimming motions 2. Arms open like a crocodile’s mouth. 3. Place on hand on top of the other with thumbs out and turning. 4. Move hands up and down. 5. Arms close. 6. Put hands to cheek. 7. Arms open. 8. Place hands as in 3 and wiggle away. And he swam right inside. And the fish swam away out of sight! Add new verses and actions such as: A spider is very tickly, A baby is very cuddly, A frog is very jumpy. Sing this to the tune of ‘One finger and thumb keep moving’; words gby Sue Nichols. 1. Interlace hands with fingers up. 2. Place one hand on top of the other, make thumbs’ swim’. 3. Open and close palms of hand. 4. Open and close thumb and forefinger. 5. Move arm like a snake. 6. Wiggle finger. Or ‘A little boy’s walk” A hand play from Emilie Poulssen’s ‘Finger-play for nursery and kindergarten’ published 1889, with beautifully illustrated with hand movements. Find instructions at: https://archive.org/details/fingerplaysfornu00poulrich . A wee ground sparrow’s nest. S/he said, “I’ll go tell mamma! This hand play requires a little dexterity! The emphasis is on comparative size. From ‘Sing a song One’ published 1978 by ILEA. Dany Rosevear added the music. When a big fish came along. When a huge fish came along. When a whale came along. A garden hand play from the delightful ‘Pat-a-cake and Beyond’ collection: http://foreverychild.ca/pdf/pat-a-cake.pdf . 1. Close right hand. 2. Place fist on left hand. 3. Make sun with arms circled around head. 4. Fingers wiggle. 5. Wiggle fingers downwards then back and forth. 6. Open closed hand. 7. Move hand with fingers together upwards then spread fingers. And then it starts to grow! This hand play game can also be used as a baby bouncing game. 1. Use hand for the leaf and forefinger of the other hand for the frog 2. Place on hand on top of the other with thumbs out and turning to make fish swim 3. Clap hands for the splash and throw out hands for the splash 4. Hop as before. Splash! How I make the water fly! Keep mouse safe from the cat. 1. Wiggle thumb and pop it in closed fist 2. Cover fist with other hand 3.&4. Lower voice and put finger to mouth 5. Thumb pops out 6. Thumb ‘creeps’ in palm of hand, beckon 7. Thumb ‘creeps’ in palm of hand, indicate cat’s whiskers 8. Throw out hand, look puzzled 9. Cover ‘mouse’ in fist. Lives softly in a little hole. Creep, little mouse, I’ve got cake for tea. Puss, Puss, Puss, Puss, where is the little mouse? Safe, safe, safe, safe in his little house! 1. Draw smile and a circle. 2. Wiggle fingers. 3. Point to eyes an make fore fingers twinkle. 4. Frown, make a shooing movement with hands, smile. For the very young. From the classic collection ‘This little Puffin’. 1. Wriggle right index finger along the floor. 2. Put finger to lips. 3. Make a hole with left thumb and index finger. 4. Wiggle finger into hole. 5. Put finger to lips. ‘Sailing’ is a rhyme by Lucy Flitch Perkins from ‘Boys and Girls Bookshelf, A Practical Plan of Character Building’ published in 1915. Music by Dany Rosevear. All children need for this rhyme is a box or washing basket for role play; the hand play below should work well. Line 1. Cup and rock hands. 2. Pull up sail then hands faced down move like the breeze. 3. Steer boat, put telescope to eye. 4. Hands to cheek. 5. Wave and drink tea. Afloat, afloat, in a golden boat! Hoist the sail to the breeze! And then come home to our teas. 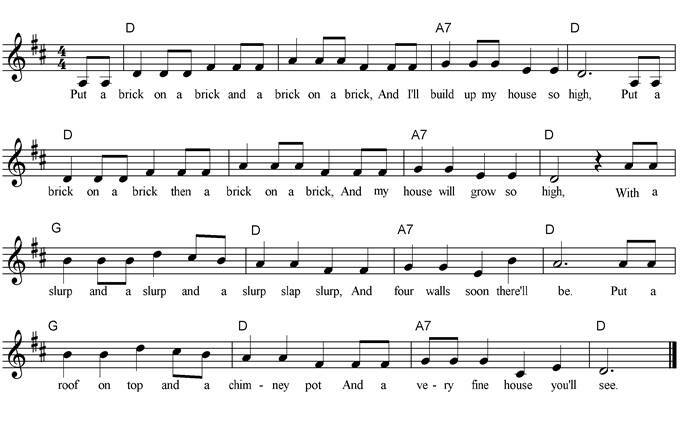 This song is adapted from the old Dutch nursery rhyme. 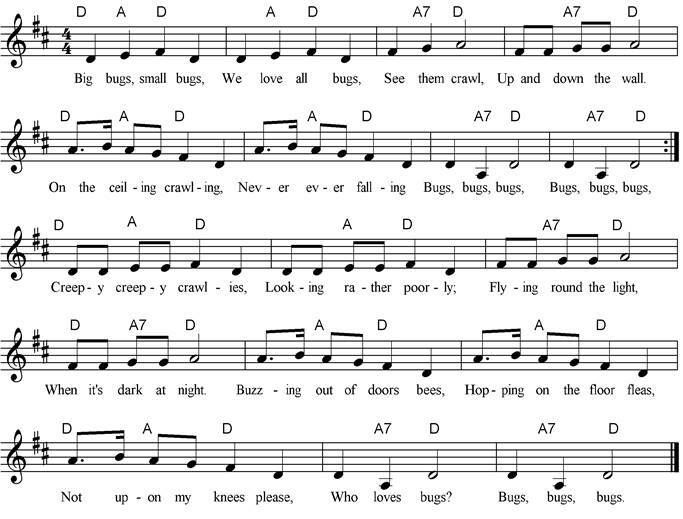 Sing this song using other creatures that move in or on the water. Young children will love to suggest other ideas! 1. With one hand on top of the other and thumbs out swish; Then (each time) make hands in a circle grow larger and larger and then give a big clap to POP! 2. Swish with hands together vertically. Rub tummy. 3. Cross forefingers and make them ‘swim’. 4. Reach hands up to make them ‘spout’. 5. Flap hands to ‘paddle’. 6. Hands ‘splash’ water. Talk about the difference between crocodiles and alligators and where they live. Move arms up and down, stroke length of arm. Repeat with fingers like teeth. Hands snap the air in different directions. Shake finger and point to self. A folk hand play game from Malaysia. We lived as a family in Kuala Lumpur in the 1950s but sadly we did not learn any Malayan rhymes and songs when we were there. Turtle: Slow fingers creep up arm. Rabbit: Finger rabbit ears bounce up arm Elephant: Fist thumps up arm. Snake: Fingers slither up arm. Rock: Fingers bounce down arm and land in hand. Finish with a clap. Boom, boom, boom, boom, CRASH! A hand play for winter. 1. Cup hand to make a cave, thumb inside is the bear. 2. Pop thumb up. 3. Fan self. 4. Circle eyes with thumbs and forefingers, pretend to eat. 5. 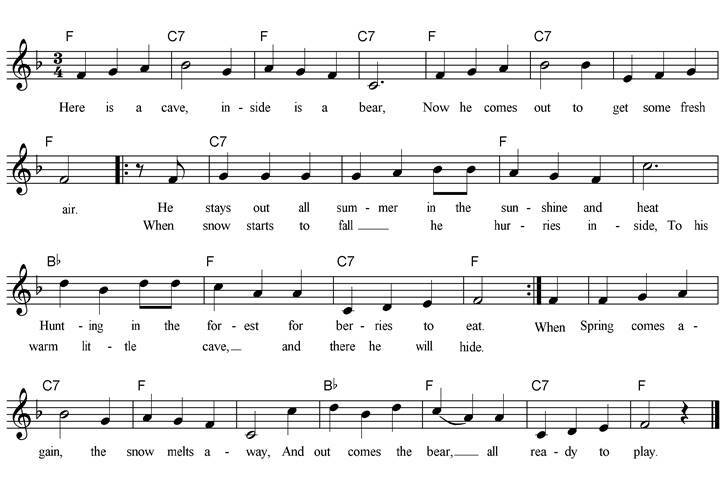 Hands fall like snow, bear returns to cave. 6. Flutter snow down over cave. 7. Open hand to show sleeping bear and the close it.8. Hands push snow aside. Pop thumb up out of ‘cave’. Now he comes out to get some fresh air. Hunting in the forest for berries to eat. To his warm little cave, and there he will hide. But inside the bear sleeps, all cosy and snug. And out comes the bear, all ready to play! The first verse from ‘Merrily, merrily’ can be found in the ‘Nursing Mother’s Association of Australia’, the two further verses are by Dany Rosevear. Verse 1. Open and close thumb and forefinger. Cup hands. Make tree with arm and fingers. Run fingers up and down. Open and close thumb and forefinger. 2. Cup hands. Make hole with thumb and forefingers. Cuddle self. Hold up five fingers.Cross wrists and flap hands. 3.Continue to flap hands. Ring arm as birds fly round. Birdie, birdie where’s your nest? Up in the tree where I love best. Come little birdie sing to me! Cosy and warm as it could be. Then watch how my birdies follow me. All of my birdies follow, follow me. 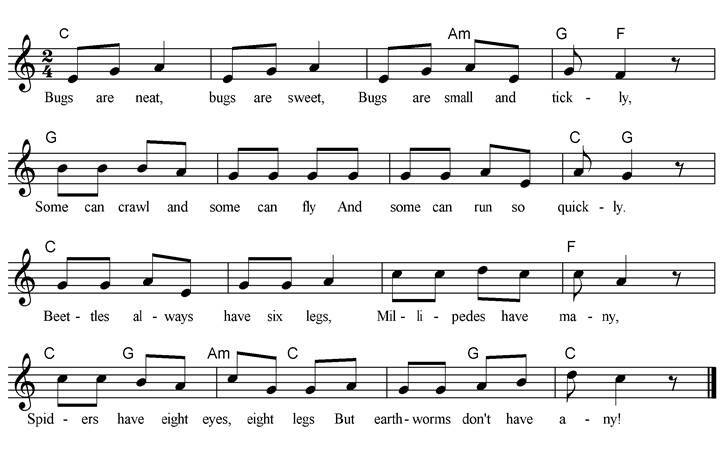 A rhyme by Ann Smith who wrote several bugs poems and rhymes for ‘Bugs Bugs Bugs! Resource Kit’ an early learning programme for Museum Victoria in Melbourne, Australia: https://museumvictoria.com.au/pages/2085/bugs-bugs-bugs-rhymes-music.pdf. Tune arranged by Dany Rosevear. Line .1 Put up one thumb and then the other. 2. Run fingers over back of hand. 3. Run fingers up palm of hand and up arm. Link thumbs and flap hands. 4. Run fingers very fast up arm and over back of head. 5. Hold up six fingers. 6. Interlace fingers, turn upside down and wiggle. 7. Point to eyes then make four fingers on each hand scuttle. 8. Wiggle forefingers then hide hands behind the back. And some can run so quickly. But earthworms don’t have any! 1. Use fists to build up house, slap hands for slurps. Put up four fingers, hands make pointed roof. 2. Make sawing motion then hammer hand. Fists as before, look proud, point to self. 3. Put up four fingers, draw windos, doors and chimney. Make finger raindrops. Knock, flat hand for rug. Wave hands across body for wind. Fists as before, look proud, point to self. And my house will grow so high. With a slurp and a slurp and a slurp slap slurp. And four walls soon there’ll be. And a very fine house you’ll see. To build up my house so high. It’s a very fine house say I.